So with the weekly status update, I planned to blog at least once a week. This seems to be turning into at most once a week by now. After the Christmas/New Year’s holiday now, I did not blog for so long that the resistance to writing is at its peak currently. There should be so much to write about after such a long time, but in practice there is so little, because things that happened long ago no longer seem relevant. Blogging paralysis! I will fix this though, my new motto: blog early, blog often! Expect blog-posts for every fart from now on 😉 Did I just blog about blogging? Shortly before the holidays, my laptop died of a mysterious illness. Actually not that mysterious: the screen is broken. Only at times like this, I finally realize how attached I am to my lappy. It is with me on the couch to check my e-mails in the morning, it is with me on my way to work, it is with me at meetings and it is with me in the evening on the couch once again. I really miss having it around and tried to replace some of its functionality with my phone, but the keyboard and screen are just too small for comfort. I also hooked up sad lappy to an extra screen at home, but then I have to sit in a chair to use it, which is also not my idea of a good time. First world problems! So what happened over the holidays? Not much, I can tell you. A lot of sleeping and gaming on the couch was enjoyed. I finally had enough of Animal Crossing now and finished 999 and Virtue’s Last Reward over the holidays. Both are really excellent games and leave you thinking about the characters and story long after finishing the games. I got Harvest Moon: Island of Happiness (that doesn’t sound sappy at all!) and Disgaea as Christmas gifts, so I am currently playing the first of those. A character in there told me ‘Do not want!’ yesterday and this is accurately sums up my feelings about reworking the anatomical variations topic. I finished something besides games too! In the holidays I was working on another crochet shawl, this time a more colorful one, with burgundy and dark purple colorchanges. I steam blocked it yesterday (that is a thing) and now It is done! Next projects include knitting a scarf for my boyfriend and to crochet a long-sleeved shrug for myself. There is really something rewarding about crafts like this, unlike programming, there are tangible results and not as much frustration. I think there is also a lesson in there about productivity in there somewhere: repeated small and easy steps (=stitches) over time finish big and daunting projects. So, instead of focusing on finishing big projects, look for opportunities to do a couple of stitches whenever you can. 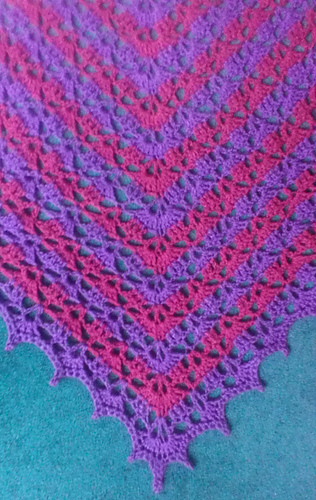 Close-up of my Elise shawl. Oh the productivity lessons! And finally, about the title of this post, I was referring to a Seinfeld episode where they were pitching a sitcom to NBC: a show about nothing. This is exactly what this blog feels like at times.